AvMap presents the concept of hybrid navigator: built-in yet portable, joining all the advantages of the in-car systems to those of the portable solutions. AvMap hybrid solutions ensure the best and safest positioning of the PND inside the car without any annoying cable nor suction cup limiting the visibility of the windscreen. After the boom of portable navigators, GPS navigation is going back into the car’s dashboard. AvMap has foreseen this trend and has turned it into its core business. The Automotive B2B unit develops all-in-one portable navigation systems and semi integrated solutions which satisfy the high quality standards of the automotive industry. For each car model, AvMap is capable of designing a tailor-made system, integrating the GPS holder in the dashboard in order to guarantee a safe navigation and at the same time an aesthetically elegant solution. AvMap can also develop for each car model a GPS that interacts with the car sound system and with external devices such as mobile phones or mp3 players. AvMap offers a wide range of products from the simplest to the most sophisticated: each car can have its own GPS. This facilitates the correct positioning of the vehicle from the standard category, to high lux. PSA Group ( Peugeot - Citroën) , Mitsubishi Brazil, Toyota Europe. 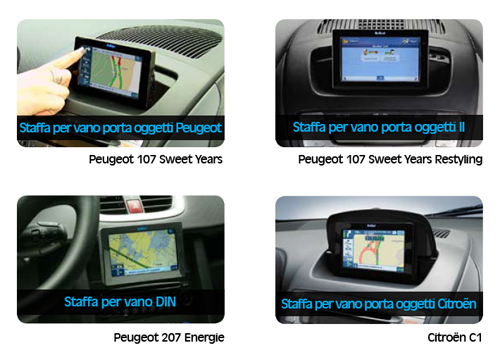 The collaboration between AvMap and Peugeot Automobili Italia starts in 2005 in Italy and it is extended in Portugal and Brazil in 2008.
which allow the navigator to communicate with the car sound system and with the iPod. the restyling of this series targeting young people, AvMap has developed a new navigator with built-in alcohol test. The partnership with Peugeot is followed by the one with Citroën Italia. In December 2008, Citroën launched the new C1 Deejay equipped with Geosat 6 deejay. For the C1, AvMap has studied a practical GPS cradle hidden in the dashboard that can be opened in order to use the navigator, and can be closed to hide it. Geosat 6 Deejay communicates with the car sound system. It also possible to control through Geosat 6 Deejay’s display the iPod placed in the special dock station in front of the gear. After Citroën Italy, in April 2008, the solution is adopted by Citroën Netherlands.